The Boy-Oh-Boy Bouquet employs roses and Asiatic lilies to send your bright and sunny congratulations on the birth of their new baby boy! 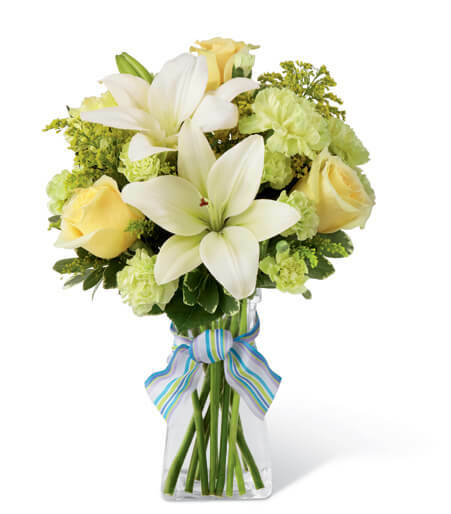 Yellow roses and carnations are brought together with pale green mini carnations, white Asiatic lilies, yellow solidago and lush greens exquisitely arranged in a clear glass gathered square vase. Accented with blue and lavender wired ribbon, this bouquet creates a wonderful way to send your warmest wishes for the adventure of parenthood ahead.